You can listen to 'Nocturne' here. I really do not know what to make of Nocturne. One moment I think it's a great, laid back album, that I enjoy listening to a lot. At another moment I'm thinking to myself, get real, start making this interesting! So, whatever else Nocturne is an album that intrigues me. If anything Nocturne is a relaxed album and yes, very good to listen to when it's dark. The songs develop themselves slowly, like the water of a brook on even terrain. Not that all songs are slow paced. Even if they are faster, like 'Only heather', the vocals and keyboards create this layer of rest that allows the guitars and the drums to be a bit wilder. The overall impression remains a mood of relaxation, of modest, perhaps even shy people making music. The background vocals, "o-oh and o-o-ooh" being an exception of boldness. It is around this point that Nocturne usually starts drawing me in. 'This chain won't break' is were the best of Tears for Fears, from before mega hit 'Shout', shines out most. 'Change' and 'Pale shelter' are songs that are not unfamiliar to Wild Nothing, as is revealed on the album later on also. This makes the album an interesting mix of 80s pop with shoegaze elements. There is also a distinct new romantics element in here, without disturbing me too much. To add all up, there is a Johnny Marr like guitar playing going on, that constitutes Wild Nothing's wild side. As a last reference here's The Cure again in its more poppy period in the second half of the 80s. Wild Nothing is a US indie group or indie dream pop band as Wikipedia lets us know, that only has one member: Jack Tatum. He started this project in 2009 and released the first album 'Gemini' in 2010. 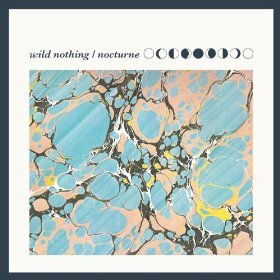 Nocturne is the second album by Jack Tatum under the name Wild Nothing. As such Tatum holds a promise for the future, as he knows how to write a song and infuse his songs with interesting moments, for which he draws mostly on familiar sounds. Don't expect overly new things or experiments on Nocturne. It's a feast of old friends that come by. This may be called the weakness of Wild Nothing. In moments like 'The blue dress', when the music develops in the direction of Howard Jones, I'm gone. It's a delicate line Nocturne balances on as far as I'm concerned. All in all, in my opinion I am reviewing a talent here that holds promise, but also needs to find his own voice more. Nocturne is not the great, fantastic album some seem to hold it for. Let me suffice with a quote from Wikipedia on 'Gemini', which works for me for Nocturne: ""While I wasn't totally convinced with Gemini as a whole, I adored it in chunks", from Blogcritics.org. It's up to you to decide. I can't do this one for you.